On July 9th, Citybikes closed down 8th Ave from 3pm-9pm and had a birthday party fundraiser for Bikes for Humanity and the Oregon Food Bank. Just how old is Citybikes? 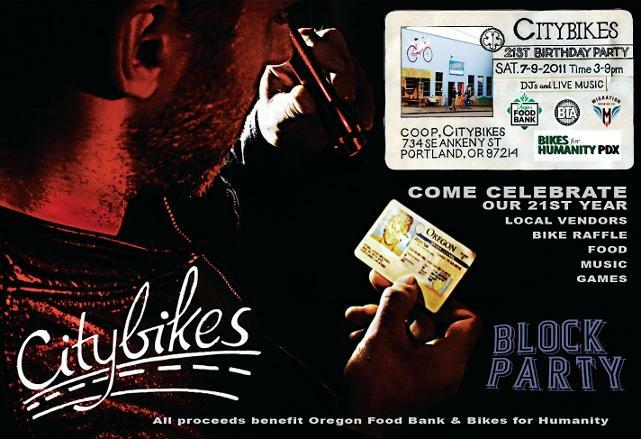 Citybikes, for all its years, came about from the hard efforts of one Roger Noehren, who founded Citybikes in the 1914 space 25 years ago. 4 years after its creation, the cooperative was formed with $58,000 and 5 people, one of whom – Tim Calvert – continues as an owner today. And so we celebrated our 21st season as a Cooperative. Roger, a continuing contributor to the coop and the Citybikes crew, enjoys his visits to each location. Today, Citybikes owns the “Mother Shop” (repair shop) and the Annex, located on 8th and Ankeny. There are 13 owners, over half of which are women. To celebrate our continued presence in the community, we plan to paint an awesome mural on the face of the Annex this summer. We received a $5,500 grant from RACC thanks to Roger Peet, a muralist and member of the Just Seeds Collective. The celebration on July 9th was the opening ceremony, and cooperators began work on the east side of the Annex space as plans were set for work on Peet’s mural. All the volunteers and Staff who worked the event! Jeff, Teressa, Rachel, Roger Noehren, Jackie, Mia, Noel, Tree, Kathy, Roger Peet, Jon, Erin S., Ashley, Nate, Steven Kung, Lindsey, Michelle, Trey, Gian, Colin, Kate…oh the list goes on!